Do you need a solution to organize your cluttered closets? N.W. Garage Cabinet Co. can help. We understand that every person’s needs are unique when it comes to closet design. We come to you for a free consultation and layout design plan! We spend as much time as you need, getting to know you, your habits, and your needs for closet organization. We work with you to find the perfect solution, so you have a space for everything. Whether you have large, bulky items that need to find a space to store or you need many drawers with dividers for small items, we can customize your closet to fit your needs. Our designers are good listeners. We think creatively and come up with a plan you will love, design to end result. 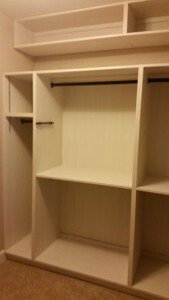 All our closets are made with top-quality laminated plywood with a solid wood structure. 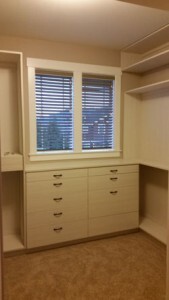 We never use particle board for the construction frame or shelving in your closets. All our wood comes from the best sources and has been treated and prepared to withstand fluctuations in humidity and temperature. We have a large selection of color options for cabinet and drawer facings. Not only do we take aesthetics and functionality seriously, we also ensure durability. Your closet features will be able to handle the weight they take on and will last for years to come—that is our guarantee! Contact us today for your free consultation and bring new order to your home with closets you love.